In order to create change, we must learn from the mistakes from our past. So far we’ve learned about the Indian Removal Act and how President Jackson set the country up for Gentrification as we know it today. If you’re a little lost be sure to read Part 1 before diving deeper into why cultures are still being driven out their communities. Once the country’s frontier reaches the Pacific Ocean, and Native American Reservation Autonomy laws became tougher to intrude on the American government, more socially conscious legislative systems turned to its rich history of displacing and marginalizing black and brown populations in a more subtle manner. A prime example of this would be Franklin Delano Roosevelt’s 1933 First New Deal policy: The Federal Housing Administration which worked in response to the housing shortage. The goal of this programs was to increase and segregate America’s housing stock. In the The Color of Law, author Richard Rothstein’s worded it as the equivalent to “a state-sponsored system of segregation.” This time instead of forcing people out of their homes, the United States government started developing large communities and denying minorities the right to join. The Federal Housing Administration used many tactics to ensure the segregation of many communities and housing developments; the most prominent and long-lasting being “redlining.” With this practice that they adopted from Home Owners Loan Corp., maps were color-coded to indicate where it was safe to insure mortgages. 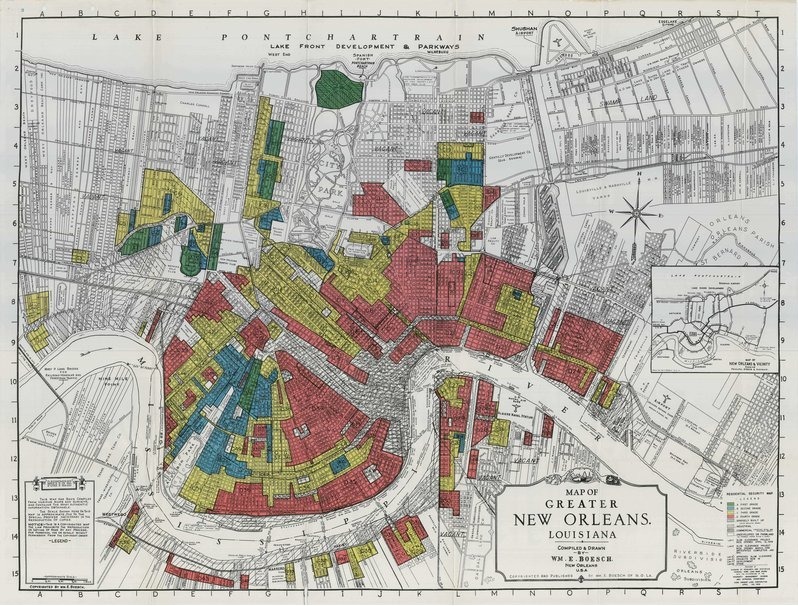 On these maps (pictured above) black communities were colored in red and deemed too risky to loan mortgages to. This made it virtually impossible for African Americans to leave these communities. They were denied home loans and many of them remained renters and were not able to accumulate wealth through home equity. The result of this treatment is a stagnant inequality that till this day is hard to shake off. In these communities that are absent of opportunity because of segregation, families were not given the chance to advance.